Very fit guy, in early adulthood, is very physically active and builds a prodigious appetite. Said person lands a cushy, deskbound job and doesn’t walk much during office hours. He gets his due in promotions, but heavier responsibilities mean he starts dropping gym time. In pockets at first, then entire weeks. Even in the gym he may be unable to put the phone down. Through it all, his metabolism slows, but he’s eating as much – if not more – than he used to, often servicing the boredom with hearty lunches and trips to the pantry. Chia, who established and manages a virtual network that connects gyms, studios and trainers in Singapore, is by now a de facto expert on distance training. We catch him in partner gym, BIGFitness by the Big Group. Even those who are physically active after hours aren’t off the hook, says Chia. The sedentary life is highly likely to induce postural problems, owing to a hunched position over the course of a work day. This results in frequent backaches and neckaches, and opens stiff or underutilised muscle groups up to accidents such as sprains and tears. The bright side, however, is that stemming the flow and turning the tide is an easier task than it sounds. Beginning a visible bodily transformation is as simple as aiming for at least 150 minutes of moderate to vigorous physical activities (MVPA) per week. This could mean taking up a fitness class two to three times a week, or simply getting 30 minutes of accelerated heart rate per day. But outside of exploring hundreds of free options provided by the Health Promotion Board, are there ways of working such activities into everyday life? Certainly, says Chia. “In the context of office workers, they can simply do stair climbs (instead of taking the lift).” Chia also recommends a simple, effective exercise that’s perfect for those with their own office room. “It’s widely known as the ‘100-Up’,” Chia says. “You know, you’re in the army – it’s like the hentak kaki.” He demonstrates the manoeuvre immediately – it’s essentially marching on the spot, with the legs (and alternate arms) raised to 90-degree holds. The 100-Up: Keeping a straight back, bring alternate arm and leg up to 90-degree positions as shown. Return to the starting position and repeat with the other pair. This constitutes one rep.
Those with gym access can also consider the kettlebell swing – mistakenly perceived as an arms-only exercise, when properly done, it involves a great many muscle groups. Be very sure to use an appropriate weight that won’t cause strain when picking a kettlebell. Maintain a straight back at all stages to ensure usage of the right muscle groups. Another great way to kickstart your #MoveIt150 journey is by setting an achievable goal and training for it – for example, you could sign up for a short, stress-free 5km run, then spend the prior weeks training towards clocking a time of your choosing. Chia finds that five clicks is a great distance to start with for someone who hasn’t had done vigorous exercise for a while. Committing to a fixed date lets you map out training days and keeps you on track, especially if you’ve signed up for the run with friends. 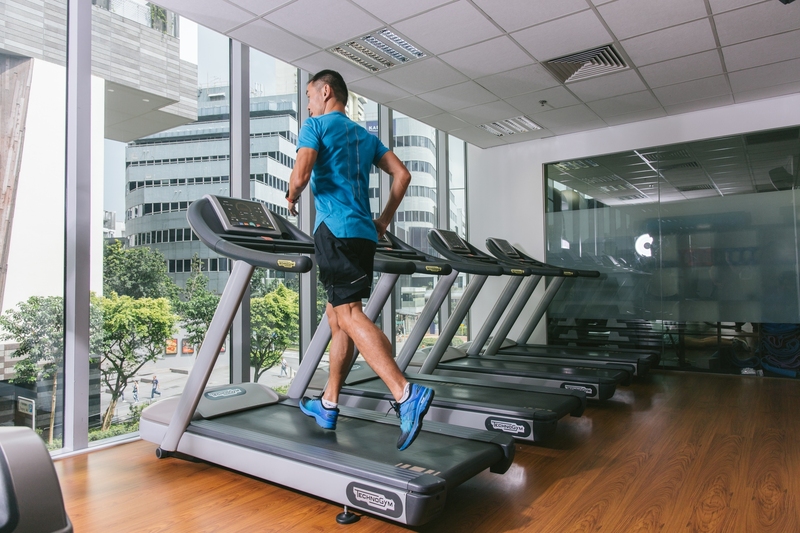 Both treadmill and pavement running are suitable for such distances, Chia says. He dispenses six great tips for those undertaking this venture. Chia has a set of tips specifically targeted at first-time and returning runners aiming to train up and complete their first long-distance run – one he optimistically refers to as the “gateway” to greater distances. In the face of the great distance ahead, many beginners react by artificially extending their stride length, often equating greater strides with faster speed. This is the opposite of what they should be doing. Whether it’s over the course of your marathon prep or right before the big day, don’t modify your diet in an attempt to improve your performance. Your metabolism will increase naturally and begin to turn dividends in the department of fat burn. “(Practices like) carb loading are only for races beyond 2 hours,” says Chia, who also advises against supplements like power gel. Race day is the worst time to try something new. You should be running in attire you’re comfortable in and familiar with – this boils down to even the socks you wear, says Chia. For footwear, he recommends a pair of fitting, proper running shoes – some participants try to get away with wearing sneakers, which are more likely to lead to injuries. That said, he warns, one should practice proper landing techniques instead of letting the shoes absorb the shock. “Running shoes can provide a false sense of security; some people tend to land on the heel,” says Chia. Not only is this bad for the knees and hips, but it is, in effect, vastly slowing down your forward momentum, leading to very inefficient and injurious runs. The combination of ear-shattering airhorns and the floodgates opening may be exhilarating, but often this spurs new runners to start at an unrealistic pace, only to quickly wear out before much of the race is done. “Start slow to go fast” is one of Chia’s favourite mantras – let the crowd thin out while you run at your own pace. Much of the race, after all, says Chia, is overtaking those who getfatigued too early. Chia also recommends finding something to focus on throughout the run to keep the mind occupied. (Our take: it’s those thoughts of waving the flag and slowing to a walk that you want to block out.) The two best candidates? Rhythm of your breathing, or the swing of your arms. Regulating both also happens to be crucial to maintaining an ideal pace, so keeping tabs on them is a trick to coming out ahead. Working runs into your weekly routine, even after concluding your first marathon, is one of the best tickets to a healthy lifestyle. As you tackle longer distances and your body gradually adapts to handle the mounting challenges, it’s great to have qualified professionals guide you on the finer points and technique. Essentially, you want a running equivalent of a personal gym trainer. HPB’s i-Run programme offers all of that at absolutely no cost – and it takes you past convenient and scenic routes such as Gardens by The Bay and Labrador Park. All featured apparel from ASICS.